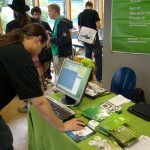 Almost two weeks ago, during the weekend, I was in Sankt Augustin to attend FrOSCon. Originally I didn’t planned to go as it is quite far from Prague and I was freshly back from vacation (and therefore quite without money). But I was asked by Sirko to give there a talk about Open Build Service and to participate in cross-distribution packaging workshop. Hard to refuse such an invitation. 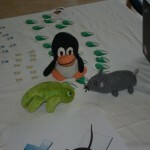 As the money was the only issue that was keeping me from participating, I decided to ask openSUSE Travel Support committee whether they would be willing to sponsor me. 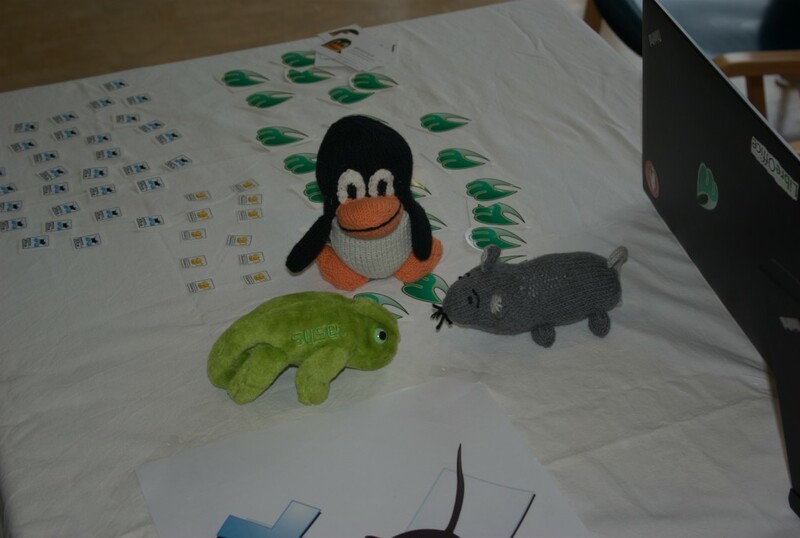 It was my first experience, but it turned out great and thanks to them, I was able to go to the event, speak about great things we have at openSUSE and have a lot of fun! My big thanks to them! 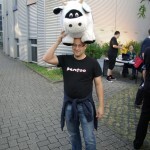 Now let’s get back to FrOSCon. It is annual event in Sankt Augustin, little bit to south from Collogne. I also spoke beforehand with Jan and since I was going there because of talk and workshop, my plan was to spend rest of my time during conference helping out with booth. So let’s start with booth. 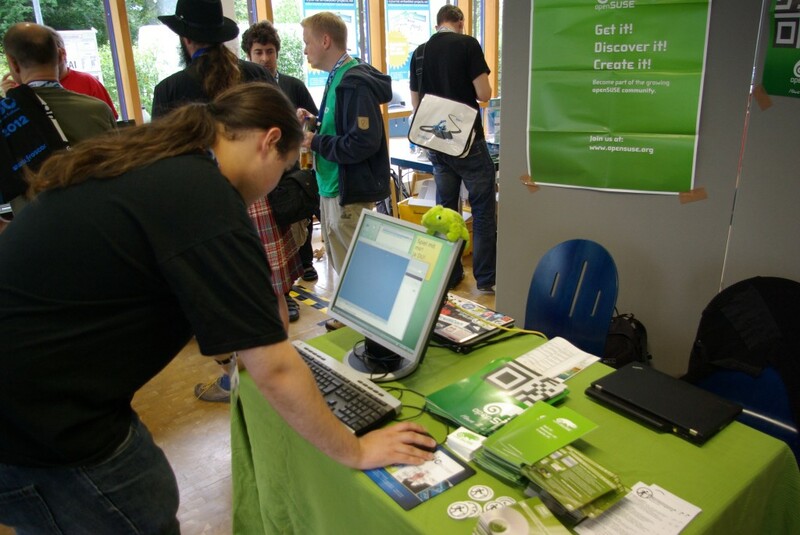 Jans brought computer with openSUSE 12.2 to show to people and plenty of DVDs, stickers and posters. I brought my plush Geeko, but unfortunately first day he decided that he will rather stay at hotel and while I was leaving my room to go to the bus station, he left my backpack and stayed at the hotel. He was found by friendly hotel stuff and awaited my return on reception desk. And I believe he regretted staying behind later as during the second day, he made a lot of friends on the conference as you can see on the photo. How was the event? 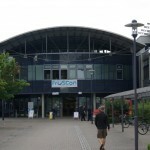 Did I managed to attend any talks? Thanks to other guys and girl we had at booth, I was able to attend the talk that I was the most interested in – talk about Vivaldi. What have I learned? Well, reasoning about Vivaldi was that there is no free and open source mobile platform. Although Google Androids is in fact open source, it is developed behind closed doors and when you get your cell, it is full of binary blobs. So Vivaldi is meant to be fully open source platform, developed in the free ecosystem with everything open source so you can mingle with it. Part of the Vivaldi is of course KDE Plasma. I’m not a KDE user for quite some time and haven’t really paid much attention to what Plasma can actually do, but looked quite impressive. Especially Plasma quick. Example that was shown was that you can write application once and depending on whether it is run on desktop or on tablet, it’s interface will change. And you don’t have to do anything! One of the points of Vivaldi was actually to be able to seamlessly move between your devices without having to experience too different environments. What else was there interesting regarding Vivaldi? Well, we heard about their troubles with Chinese HW vendor, who didn’t get what GPL means and was hard to get from him sources for kernel and after that fix all errors in them. And we heard that they are building on top of Mer which actually used/uses Open Build Service! In the afternoon I had a talk about obs. You can see my students on the picture. I spoke about obs, showed some advantages and showed them the interface. As usual, you can find slides from my talk on github, fork them and use them for your own presentation. Or if you want, you can just download the pdf. There were some questions and people were quite interested in such a small group. Usually on big events with big audience, quite some people show up, listen, but almost nobody really cares. These people had to go to the workshop room and they were interested and talked to me back. 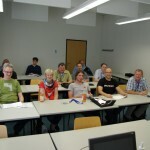 After obs talk, I invited them to the packaging workshop we had afterwards with colleague from Mageia and Fedora. There was smaller audience but as there were three of us and two of them actually spoke German, we divided quickly into small groups. What else did we do? There was a social event, where we got some sausages and local beer. According to local customs, beer is served in tiny (0.2l) glasses. 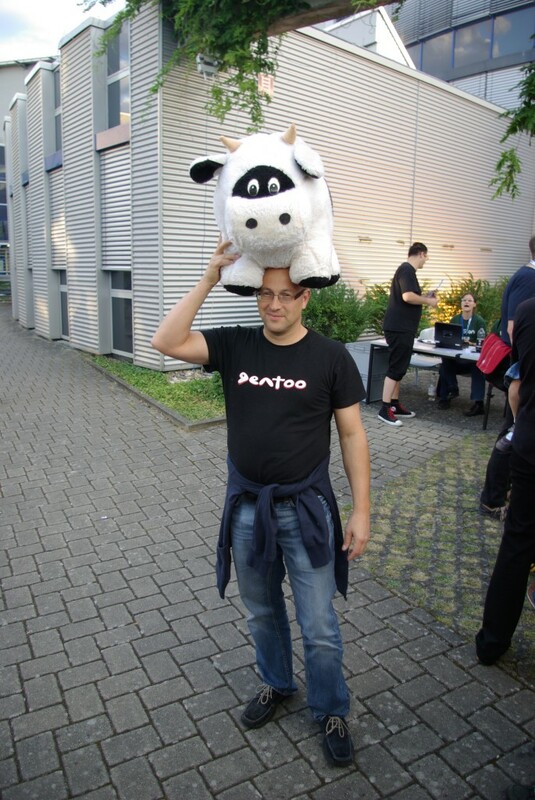 I also met there a Gentoo guy who was carrying Larry the cow! Next day, I stayed almost all the time at our booth. But at some point I saw Michael “Monty” Widenius approaching Fedora guys so I joined the discussion as it looked interesting. I found out, that Fedora doesn’t ship MariaDB yet and that they had some small troubles getting it in. So I offered our .spec files as we were build MariaDB in obs for Fedora some time already. 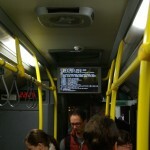 We talked about the solutions, what’s going on in MySQL word and it was a nice talk. 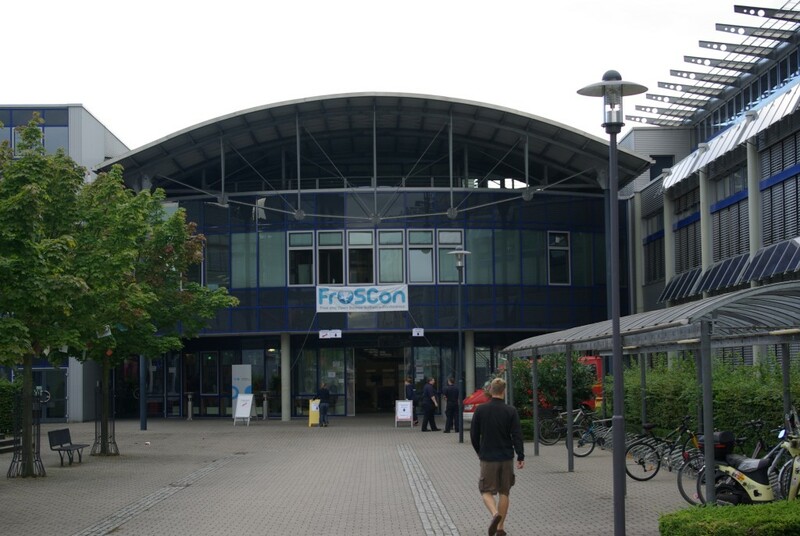 So overall, I had a great time on FrOSCon. Another thanks to Travel Support Program for supporting me and Sirko for inviting me. 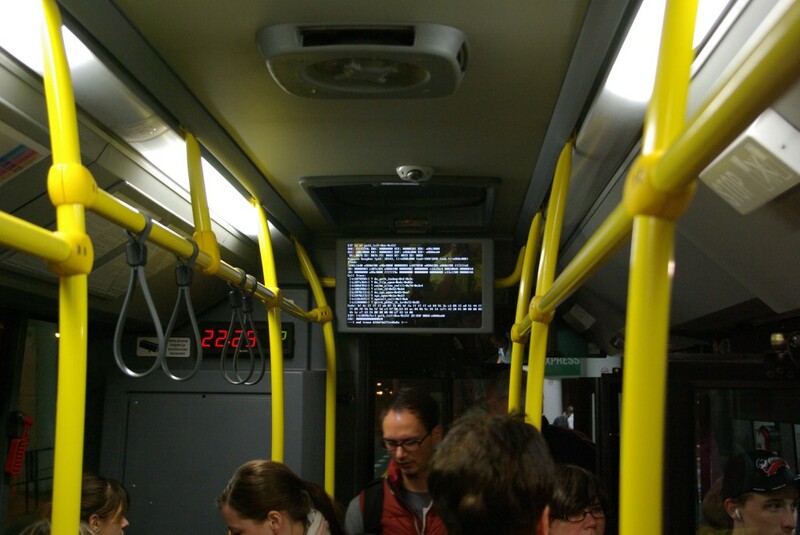 And the last note, when I got back home and got to bus, first thing that welcomed me in Prague was kernel panic message on the information panel in the bus. Just a nice ending of a great trip. Nice report, dude, good read!